Happy New Year! We are back at it today for our normal hours in both locations. So, please come see us! We are anxious to see you all and hear about all of your holiday fun. 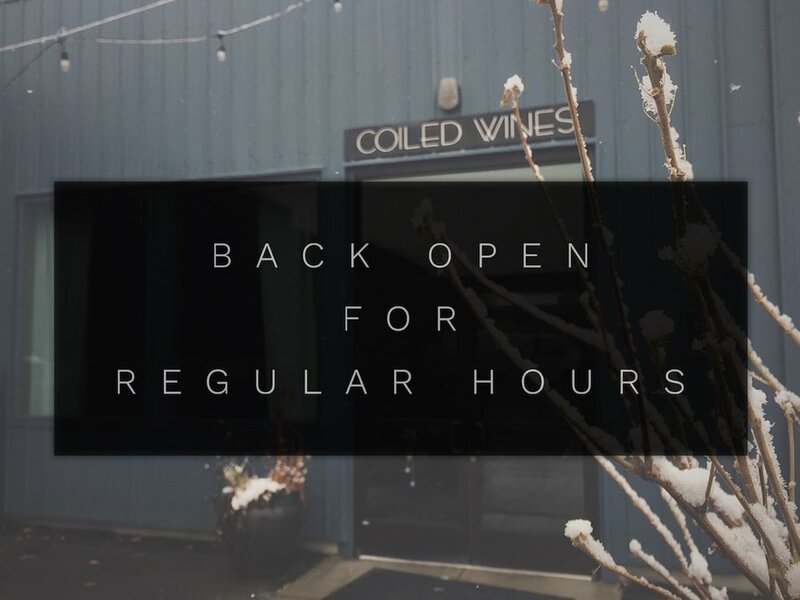 As you know, Coiled was closed for the last 10 days for "Winter Break". We had a chance to spend some time as a team to reconnect, goal set, and fine-tune Coiled operations. As always, we are very curious to hear your feedback on what Coiled could be doing to improve this year! Please feel free to reach out if you have any suggestions, whatsoever. January tends to be the month of reprieve for many. But, somehow, we are feeling very busy and full! We are gearing up for a very busy February and spring ahead. We hope to see you for our regularly scheduled Bingo this month (Wednesday, January 24th) at the downtown location. Check your emails for a special "Valentine's Day" event notice from Coiled that will be coming shortly. We will be doing some fantastic stuff in both locations! 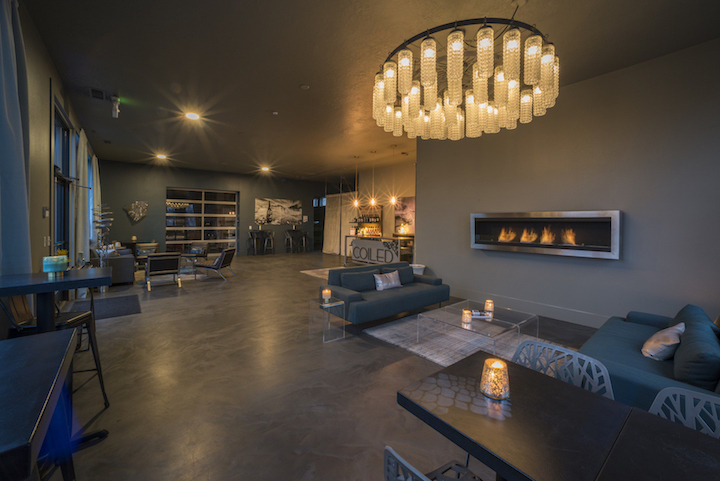 Join us Wednesday, January 24th for Coiled Bingo at the Wine Bar! Every Tuesday for service industry, receive 20% off all Coiled glass pours and bottles! Every Wednesday through Saturday night from 5-7 pm, join us for $2 off glass pours and $5 off bottles! I have high hopes for 2018. On the Coiled front, we will be fine-tuning many aspects of the business in an effort to run more efficiently and effectively. Having moved the business 4 times in 5 years, we have always felt like we were playing catch up. Now, we can finally get ahead of the game. That comes as a tremendous relief. Coiled has started the year with a 10 day closure, allowing us to spend some fun time together (and even get our toenails done). We always have fun when we are under the same roof, but it is a real treat to spend time together outside of work. It boggles my mind how close I am to my staff and how close they are to each other. We are definitely a family. In theory, I really don’t believe that is the best way to operate because it complicates things. Fortunately, theory has taken a backseat to reality. It makes coming to work much more fun and meaningful, even if it does add some extra challenges. I have spent a lot of time thinking about how unique and fulfilling it is to make wine at Coiled. I have worked at a number of other wineries, and this is a radically different experience. The wine becomes so much more when you know the commitment of the people who sell it and the people who drink it. I think I would be bored with winemaking by now if it weren’t so deeply personal. I was racking the Rizza base wine the other day in preparation for filtration. Meredith helped me and it was so much fun analyzing the muck at the bottom of the tank (lees). It was like taking the pulse on all the wine had been through over the past few months. There were also loads of tartrates from the tank and they looked and felt like magical salt scrub. After mucking about in lees and tartrates for 18 years, it is still fantastic. The Rizza base is now filtered and we will bottle 550 cases next week. That means I will dissolve sugar into the base wine tanks, then as we bottle, we will add encapsulated yeast to each individual bottle (6,600!). The bottles will be capped and laid down to ferment a second time over the next several months. Then in May, I will head to Oregon again for the disgorging (getting the yeast out of the bottle once the second fermentation is complete). Getting Rizza bottled is a big undertaking, but I also have all my other Coiled releases to look after. I will rack the Dry Riesling soon to make room for all of my 2016 reds that need to come out of barrel. Those reds will go to tank for blending and filtration before bottling, which happens at the end of February. All red blends must be finalized this week, so I can get numbers to the glass decoration company. The blend is silk-screened on the glass, and they need that info 6 weeks before decoration. All of this to say there are a lot of steps we are taking to get the wines ready to meet you in April. January and February will be very busy wine months. We are also finalizing the details for Valentine’s Day events at both spaces. If you are looking for something different that a traditional dinner out, stay tuned. We will send more info and RSVP options next week. I hope 2018 is off to a great start for all of you. I don't really believe in New Year’s resolutions, but I always find myself evaluating the previous year and reflecting on what I hope to accomplish in the new year. As we get more streamlined at Coiled, I am determined to spend more quality time with friends and family. Don’t get me wrong. I know my life is not going to magically calm down. I know it won’t, so my priority is be fully present when I am with my peeps. Here’s to all of the opportunity in front of us this year!